At first sight, what I understand here is that I will get a shield that lasts 20 seconds or until absorbed 1235 damage. Once it banishes, I will be healed by an amount equal to half of the damage absorbed, 617 in my case. Also, while shield is active, damage done by my skills and basic attack will grant me health equal to 5% of the damage done. And finally, 25% of damage done to me will be absorbed by the shield. But actually, what the shield does is something different. For each enemy attack, the shield (Solid Shield buff) will absorb 25% of that damage, and then, half of this absorbed damage will be granted to me as health. But unluckily, this is bugged and I don't get my 12.5 health points. Pincerhorn hit me for 125 damage. 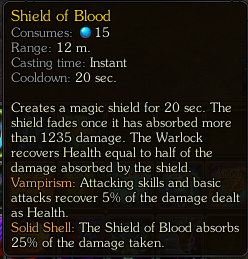 25% of that damage should be absorbed by Blood Shield, which is 31.25 damage. Then, half of that damage will be healed to me, which should be 15.62. But the shield only gave me 3 health. Where are the other 12.62 health? Edited by Healinghug (Elgore), 06 November 2015 - 10:19 AM. Actually the 125 dmg he did is the result of -25% of the damage he would do to you, so the shield absorbed X. If you put 125 as 75% of the real dmg, we have the full dmg as 166, with the shield absorbing 25% = 41.5 dmg absorbed. You should've get 20.75 hp back. However, Seeing the screenshot here i can see that you healed 3 before taking the 125 dmg, so i guess the shield was already gone and the 125 is the full dmg. Edited by Solsagan (Elgore), 06 November 2015 - 12:41 PM. Absorb is not damage reduction, redirection or sharing. It means that from the total damage, the shield will receive a x%, but the character will still receive the totality of the damage. The same happens with the Wandering Spirit. 12% of the damage you get is absorbed by him. You still receive the same damage, but he loses health, and thus, he lasts less. If someone hit me for 1000, my character health will go down by 1000 and the shield (25% absorb) will receive 250 damage. Then, half of that absorbed damage is supposed to heal me (125 dmg). In that screenshot the shield was up and running. If you look closely, the healing always happens BEFORE the damage is dealt to me. When the monster misses,, the healing also triggers before missing, healing me by 0. The last healing, comes from the last attack in that screenshot because 3 healing can't come from a missed attack. BTW, i did some tests with a friend, and it doesn't work as it is supposed to work. My friend hit me for around 800 dmg both with and without shield, and the shield kept healing me for ~15 damage, when it should be ~100. Edited by Healinghug (Elgore), 06 November 2015 - 01:33 PM. I thought it was working like the Healing Shield from sorcerers, my mistake. Send a ticket to the support team and if possible attach screenshots or a video showing the problem, they'll know better. Mental Blow is not a skill from warlocks only. Mental Blow is a skill from general mages. I have tested Mental Blow on several monsters and the only time Intuition did not activate was every time I missed the target. I'm not calling you a liar but it doesn't happen for me like it seems to happe for you.